Flowchart shows disposition of those male veterans putatively unexposed(A) and exposed (B) to head injury. Asterisks indicate suspected cognitive impairment but deceased, refused follow-up assessment, or had other medical confounds that prevented valid assessment of cognitive and functional abilities; dagger, participant was included in the statistical analyses. Background Depressive symptoms are common and can be debilitating in the months after head injury. Head injury can also have long-term cognitive effects, but little is known about the long-term risk of depression associated with head injury. We investigated the lifetime rates of depressive illness 50 years after closed head injury. Methods Participants were male World War II veterans who served during 1944-1945 and were hospitalized at that time for a head injury, pneumonia, or laceration, puncture, or incision wounds. We used military medical records to establish the presence and severity of closed head injuries. Veterans with (n = 520) and without (n = 1198) head injuries were interviewed in 1996-1997 for their lifetime history of depressive illness. Men with dementia were excluded. Results Veterans with head injury were more likely to report major depression in subsequent years and were more often currently depressed. Using logistic regression and controlling for age and education, the lifetime prevalence of major depression in the head injured group was 18.5% vs 13.4% in those with no head injury (odds ratio = 1.54, 95% confidence interval = 1.17-2.04). Current major depression was detected in 11.2% of the veterans with head injuries vs 8.5% of those without head injury (odds ratio = 1.63, 95% confidence interval= 1.07-2.50). This increase in depression could not be explained by a history of myocardial infarction, a history of cerebrovascular accident, or history of alcohol abuse. The lifetime risk of depression increased with severity of the head injury. Conclusion The risk of depression remains elevated for decades following head injury and seems to be highest in those who have had a severe head injury. Disability after head injury can be attributed to physical, cognitive, or psychosocial factors. 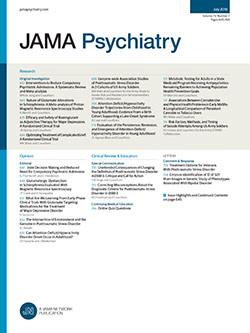 Several studies have suggested that the psychological sequelae can be particularly debilitating.2-7 Depression is the most cited mental disturbance, with prevalence rates of about 26% in clinical samples at initial assessment,3,8 and 18% to 31% 6 months after injury.9 Virtually no information is available, however, from population-based samples regarding the long-term risk of depression after head injury. Reports of increased risk of Alzheimer disease and other dementias many years after head trauma10,11 suggest that head injury may have lasting neurological effects that are not immediately evident. We compared lifetime risk of depression between veterans who were hospitalized for head injury during their military service in the 1940s and veterans who were hospitalized concurrently for other serious injury or illness (ie, lacerations or pneumonia). We also examined the risk of current depression 50 years after the injury, hypothesizing that the known increased risk of depression immediately following head injury may continue for many years. A notable advantage of this study is that the errors associated with recall of a head injury were avoided because injury episodes were documented by military medical records. The sample comprised the nondemented participants of an epidemiological study of head injury and dementia. A detailed report of the methods has been published.10 All procedures were approved by the institutional review board at Duke University Medical Center, Durham, NC. Informed consent was obtained at the time of each contact with participants or their proxy informants. Participants were World War II US Navy or Marine Corps male veterans who were on active duty during 1944-1945 and hospitalized during their military service with a diagnosis of (1) head injury, (2) pneumonia, or (3) laceration, puncture, or incision wounds. With the exception of 3 head injuries occurring in 1942, all injuries were sustained between 1943-1945. The Medical Follow-up Agency of the Institute of Medicine, Washington, DC, provided service numbers for veterans who had qualifying diagnostic codes recorded on their military "F-cards." The F-cards provided a composite report of hospital admissions and discharges within a given year. We next requested that service numbers be matched to names and other identifying information from the Beneficiary Identification and Records Locator System and Compensation and Pension databases of the Department of Veterans Affairs. We identified4022 men who putatively had no head injuries (hereafter nonhead injured). They had a diagnosis of pneumonia (n = 1740) or laceration or other wound(n = 2282) and no diagnostic code indicating head injury. Another 4509 veterans had codes suggesting closed head injury. We obtained military medical records for 3460 of the veterans with putative head injuries from the Department of Defense National Personnel Records Center, Washington, DC. Trained staff abstracted military medical records for information about head injuries, including cause of injury and duration of loss of consciousness or posttraumatic amnesia. Men were then considered "exposed" if they had experienced head trauma that (1) was documented in the military medical records; (2) occurred during military service; (3) produced loss of consciousness, posttraumatic amnesia, or nondepressed skull fracture; (4) did not penetrate the dura mater; and (5) did not result in significant cognitive impairment or neurological sequelae more than 3 months after trauma. "Significant" sequelae were those likely to cause substantial limitation in activities of daily living. We also abstracted information about whether the injury occurred in combat. For cost reasons, we did not abstract the military medical records of men in the group who did not have putative head injuries. After medical record review, 1422 of the 3460 putatively exposed veterans met criteria for head injury. Reasons for exclusion were (1) the medical record lacked evidence of head injury (n = 1149) or lacked evidence of loss of consciousness, posttraumatic amnesia, or hospitalization for head trauma (n = 238); (2) the only reported head injury was prior to enlistment (n = 189); (3) the record documented a penetrating head injury, depressed skull fracture, brain surgery, or severe neurological sequelae (n = 78); (4) the individual was female or not in the armed services during 1944-1945 (n = 305); or (5) the individual died during military service (n = 79). Head injuries were sustained from a variety of sources: motor vehicle crashes, 26%; blast concussion, 17%; fights with peers, 7%; falls, 19%; sports injuries (including boxing), 12%; and miscellaneous other wartime happenings, 19%. It is unclear how often intoxication was involved, but alcohol use at time of injury was noted in 7% of the medical records. We rated severity of head injuries using a modification of the scale of Frankowski and colleagues12 that eliminated consideration of evidence (unavailable in the 1940s) of cerebral contusion, laceration, or intracranial hematoma. The resulting categories were (1) mild injury (ie, loss of consciousness or posttraumatic amnesia for less than 30 minutes) with no skull fracture; (2) moderate injury (ie, loss of consciousness or posttraumatic amnesia for more than 30 minutes but less than 24 hours) and/or a skull fracture; and (3) severe injury (loss of consciousness or posttraumatic amnesia for 24 hours or longer). Based on dementia screening and assessment procedures described in the"Procedures" section, some additional veterans were excluded (Figure 1). The present analyses included 1198 nonhead injured and520 head injured men. Lifetime history of depression was determined from a structured telephone interview with the veteran or his proxy informant inquiring whether the veteran had ever had a period of at least 2 weeks of any of the following: (1) depressed, sad, or blue mood; (2) loss of interest or pleasure; or (3) irritability.16 Individuals who did not report any of these symptoms were considered to have no history of major depression. Participants who reported at least one of these symptoms were given a modified version of the Diagnostic Interview Schedule17 section on depression. This entailed asking if during the periods for which they reported at least one of the aforementioned symptoms, whether they also had problems with (1) appetite; (2) sleep; (3) feeling slowed down, restless, or fidgety; (4) energy level; (5) feelings of worthlessness or guilt; (6) concentration; or (7) thoughts about death or suicide. Participants were asked if they were currently experiencing these problems. To meet the DSM-IV criteria18 for major depression, 5 symptoms, which 5 symptoms, which included depressed mood or loss of interest or pleasure, had to be endorsed. Minor depression required 2 symptoms, at least one of which had to be depressed mood or loss of interest or pleasure. To assess a history of alcohol abuse, we included the CAGE (C Have you ever felt the need to c ut down on your drinking? A Have you ever felt a nnoyed by criticism of your drinking? G Have you ever felt g uilty about your drinking? E Have you ever taken a drink [e ye opener] first thing in the morning?) questionnaire19 in the interview. Two or more positive responses were considered as indicative of possible alcohol abuse. We used t tests to compare differences between age and years of education for the head injured and nonhead injured groups. The association between head injury and the dependent variables of current major depression and lifetime risk of major or minor depression was assessed using logistic regression models with age and education as covariates. Analogous models assessed the association between severity of the head injury and depression variables. In some models, history of alcohol abuse, myocardial infarction, and cerebrovascular accident were included as covariates to assess whether these medical conditions, which previously have been associated with depression, may explain the association between head injury and depression. The effect of cognitive status was assessed both using a 2-way factorial analysis of variance to compare the TICS-m scores in relation to head injury and depression, and using the TICS-m score as a covariate in logistic models. In all tests, a 2-tailed α level of .05 was considered statistically significant. Lifetime prevalence of major depression was 18.5% in those with a history of head injury compared with 13.4% in those without (Table 1). Overall the head injured group was slightly older (mean[SD] = 73.2 [3.4]) than the nonhead injured group (mean = 72.5 [3.8]) (t1716 = −3.73, P<.001). The mean (SD) age at which head injury was sustained was 20.9 (3.3) years. Lifetime risk of major depression was significantly increased in men with a history of head injury (odds ratio [OR] = 1.54; 95% confidence interval[CI] = 1.17-2.04). Increasing age was associated with decreased risk of lifetime history of major depression (χ21 = 9.47, P = .002), but education was not associated with depression (χ21 = 2.10, P = .15). Lifetime prevalence of minor depression showed a trend toward association with a head injury in early adulthood (OR = 1.43, 95% CI = 0.94-2.19). Current major depression was evidenced by 11.2% of the head injured group compared with 8.5% of the controls (OR = 1.63, 95% CI = 1.07-2.50; Table 1). A history of head injury was also associated with prior major depressive episodes (OR = 1.48, 95% CI =1.05-2.09). When we treated head injury severity as a 4-level categorical variable, lifetime risk of major depression varied with head injury severity (Wald χ23 = 9.16, P = .03). Using the nonhead injured as the comparison group, the OR for lifetime risk of depression was1.99 (95% CI = 1.11-3.57) for severe head injury, 1.40 (95% CI = 0.97-.03) for moderate head injury, and 1.49 (95% CI = 0.96-2.31) for mild head injury. The lower OR for the mildly and moderately head injured groups suggests some added risk of major depression with severe head injury, although the similarity of the ORs for mild and moderate head injury compared with any head injury suggests that the decreased level of significance for these 2 subgroups may reflect their small sample sizes. We examined whether other medical conditions could explain the association between head injury and lifetime risk of major depression. In a logistic model that included covariates for history of alcohol abuse, myocardial infarction, and cerebrovascular accident, as well as age and education, the adjusted OR for head injury and lifetime depression differed little from models using only age and education as covariates (Table2). A history of alcohol abuse (n = 409; χ21 = 34.21, P<.001) and a history of myocardial infarction (n = 335; χ21 = 8.06, P = .004) were themselves associated with increased risk of a history of major depression, while history of cerebrovascular accident was not (n= 194; χ21 = 1.92, P =.16). In a model using history of alcohol abuse, myocardial infarction, and cerebrovascular accident as covariates, the adjusted OR for head injury and current depression (OR = .64; 95% CI = 1.06-2.55) again differed little from the model with only age and education as covariates. Increasing age was associated with a decreased lifetime risk of major depression for those without head injury (χ21 =13.81, P<.001). Lifetime prevalence of depression decreased from 16.51% for men aged 65 to 69 years to 8.49% for those aged80 years and older. In more complex models using a history of alcohol abuse, myocardial infarction, and cerebrovascular accident as covariates, only age and head injury showed a significant interaction effect (χ21 = 6.73, P = .01). Exploring the interaction of head injury and age as predictors of lifetime major depression, we conducted post hoc analyses categorizing veterans into 4 age groups and calculating ORs for each group against a comparison group of the nonhead injured veterans. The OR for head injury and history of lifetime depression was 0.81 (95% CI= 0.45-1.43) for men aged 65 to 69 years, 1.45 (95% CI = 1.07-1.97) for those aged 70 to 74 years, 2.61 (95% CI = 1.58-4.30) for those aged 75 to 79 years, and 5.95 (95% CI = 2.05-17.23) for those aged 80 years and older. Because of the previously reported association between head injury and dementia, we wondered whether the higher OR in the oldest group was attributable to an increased prevalence of prodromal dementia in the head injured. However, cognitive screening scores in the oldest group did not differ with head injury or depression status (total model F3,89 = 0.24, P = 0.87). We explored other explanations for our findings. Differences in cognitive status between head injured and nonhead injured groups did not explain our findings. Addition of the TICS-m score as a covariate in the logistic models did not contribute significantly to risk of depression (χ21 = 0.01, P = .91), and the association between head injury and depression remained essentially unchanged. We found no difference in the association of lifetime depression history with head injuries that were sustained in combat vs noncombat settings (χ21= 0.46, P = .50). Excluding the 101 veterans for whom a proxy informant provided the information about lifetime history of depression did not meaningfully alter the association between head injury and depression. We found an association between head injury during early adulthood and lifetime prevalence of major and minor depression. This finding may not be surprising given the reports of increased rates of depressive symptoms shortly following head trauma.3,6,7,9,10 However, in contrast to most other work on head injury sequelae, this study used a population-based prospective historical cohort design to assess the long-term effects of documented head injury in early adulthood. Our finding of increased risk of current major depression among head injured members of our elderly cohort suggests that detrimental effects of head trauma in early adulthood can continue for 50 years or more after the initial injury. This finding also indicates that a single depressive episode shortly after head injury does not explain the association between head injury and depression. Depression represents a major societal, financial, and public health issue. Patients with depression use more medical services and have poorer quality of life than the nondepressed.22 The National Comorbidity Survey estimated a lifetime prevalence of major depression among male adults to be 12.7%,23 while a population-based study of older adults in Cache County, Utah, reported a lifetime prevalence of major depression in men to be 9.6%.15 These rates are comparable to rates in the nonhead injured men in the present study. Consistent with findings from another population-based study using the same instrument to measure depression,16 we found that lifetime prevalence of major depression decreased with age but that prevalence rates for current depression showed no similar pattern of decline. The decline in lifetime prevalence with age may be attributable to selective survival of men without a lifetime history of major depression24-26 or to poorer recall of a history of depression among older participants. Another explanation is a birth cohort effect, with younger participants being more likely to report histories of depression.27-29 Considering these factors, it is striking that the association between early-adult head injury and lifetime prevalence of depression was strongest among those aged 80 years and older. We caution against overinterpretation of this finding because of the small size of the 80+ age group (n = 106 of which 9 veterans had depression). We also note that head trauma has been suggested as a risk factor for Alzheimer disease and other dementias.10,11 Previous reports suggest that depression may also be associated with Alzheimer disease or an early symptom of the disease.30 Although we found no cognitive screening score differences in the oldest group related to head injury exposure and depression status, we cannot rule out the possibility that some of the men in the 80+ age group may have been in prodromal stages of dementia, especially since 4 of the 6 head injured veterans in this group with lifetime history of depression reported current depression. Even if this is the case, however, it does not contradict the notion that there are long-term consequences of head injury. Limitations of this study include its use of only male veterans and its lack of information on age of onset of depression. We cannot rule out that the veterans with head injuries carried a heavier medical burden in areas not addressed by our questions about stroke, heart disease, and substance abuse. It is also possible that some of the men with head injuries had a preexisting psychiatric disorder predisposing them to both head injury and depression. We regard the latter as an unlikely explanation of our findings because the frequency of depression before the age of 20 years in this cohort was probably low, and those with significant psychiatric history would likely have been excluded from the military at enlistment screening. We wondered whether posttraumatic stress disorder, and not depression, could explain our findings given that this study's participants were hospitalized during wartime military service. We found no significant differences in rates of depression between veterans who received head injuries in combat and those who did not. Because many of the nonhead injured veterans had incurred other serious injuries in combat, we conjecture that the exposed and unexposed groups were fairly similar in this respect. It is possible that some of our participants had posttraumatic stress disorder and depression, but such comorbidity would not change the rate of depression. Our findings suggest that the effects of head trauma continue for decades after injury. The cost of depression to individuals includes shortened life span and decreased quality of life. The costs to society include increased burden of illness, adding to the already extensive cost of brain injuries. Accepted for publication June 26, 2001. This study was supported in part by grant NO1-AG-4-2142 from the National Institute on Aging, National Institutes of Health, Bethesda, Md. This study was presented at the annual meeting of the American Association for Geriatric Psychiatry, San Francisco, Calif, February 25, 2001. We gratefully acknowledge the staff of the Program in Epidemiology of Dementia at Duke University Medical Center for their many efforts on this project. Corresponding author and reprints: Brenda L. Plassman, PhD, 905 W Main St, Box 41, Durham, NC 27701 (e-mail: brenda.plassman@duke.edu).